One of the coolest common opossum facts is that newborn opossum babies are only about the size of a raisin! 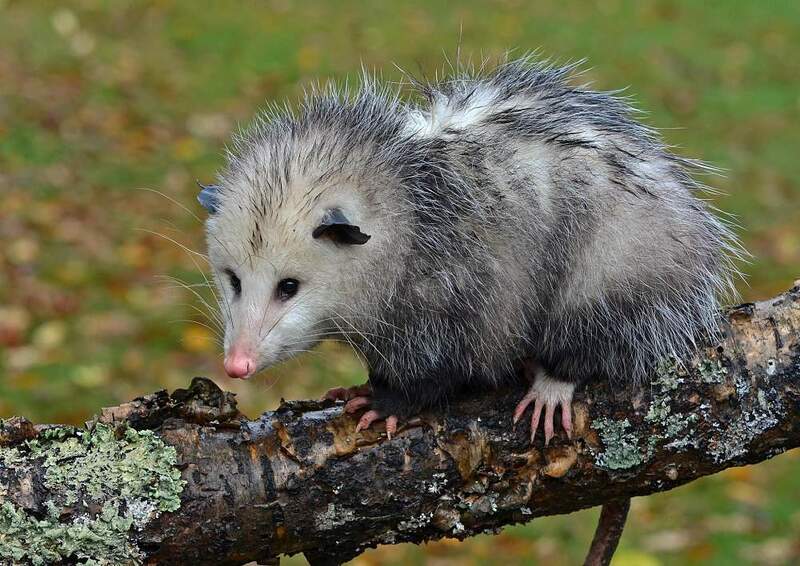 The common opossum, also known as the Virginia opossum, is a somewhat maligned but fascinating creature. What is a possum? 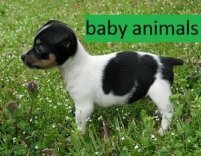 Well, it is not a rodent, although it resembles a very large and slightly eerie looking rat, with a scruffy coat of coarse grey and white fur, and a flesh-bare tail. The common opossum lives in trees, can hang by its prehensile tail, and is the only non-primate to have opposable big toes, but it is not a monkey. The opossum is actually a marsupial, which means opossum babies are raised in a pouch on the mothers belly, just like a kangaroo. 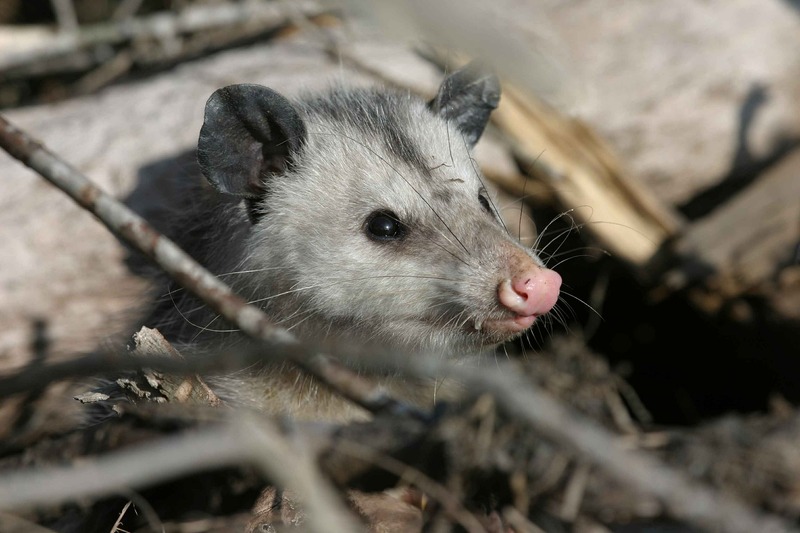 The word opossum comes from the Algonquin Indian language, and is said to mean "white animal." The "o" is sometimes silent, and is often left out all together. 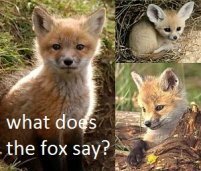 In fact, possum without the "o" is the common spelling and pronunciation throughout much of the United States, and there is little confusion in those circles when referring to the American animal, although it is scientifically inaccurate. There are about 70 different species of marsupials called "possums" found in Australia and Indonesia, which are members of the zoological families Phalangeridae and Petauridae, including brush-tail possums and the little sugar glider often kept as a pet. 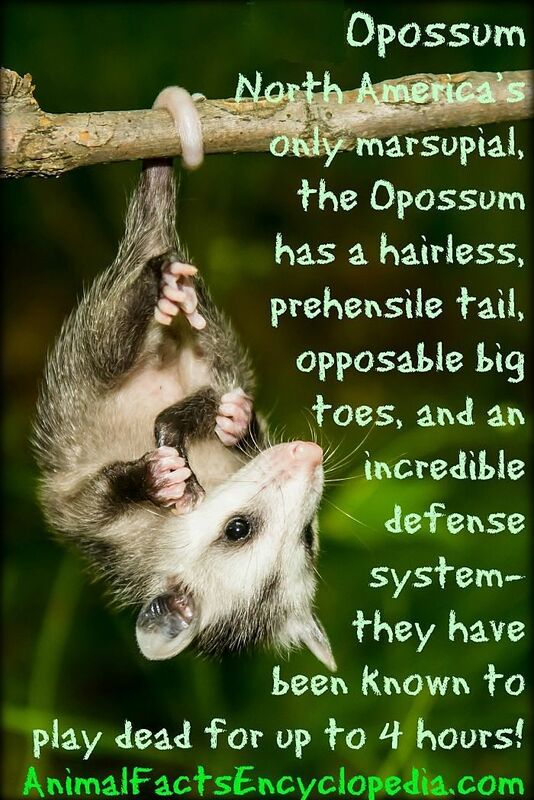 And there are over 100 species of marsupials called "opossums" found in the Western hemisphere, which are members of the family Didelphimorphia, including the common or Virginia opossum we will be covering here. Facts about possums often include claims that they are disease-carrying dangerous creatures. 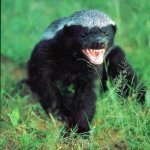 However, the Center for Disease Control reports that in the United States, the vast majority of recorded rabies cases come from the bite of 4 animals - raccoons, skunks, foxes and bats. Rabies is a terrible virus that attacks brain function. 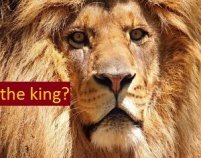 Often, the first sign that an animal has rabies is a change in behavior patterns. When people see opossums out and about during daylight hours, they assume there is something wrong with the normally nocturnal animal. 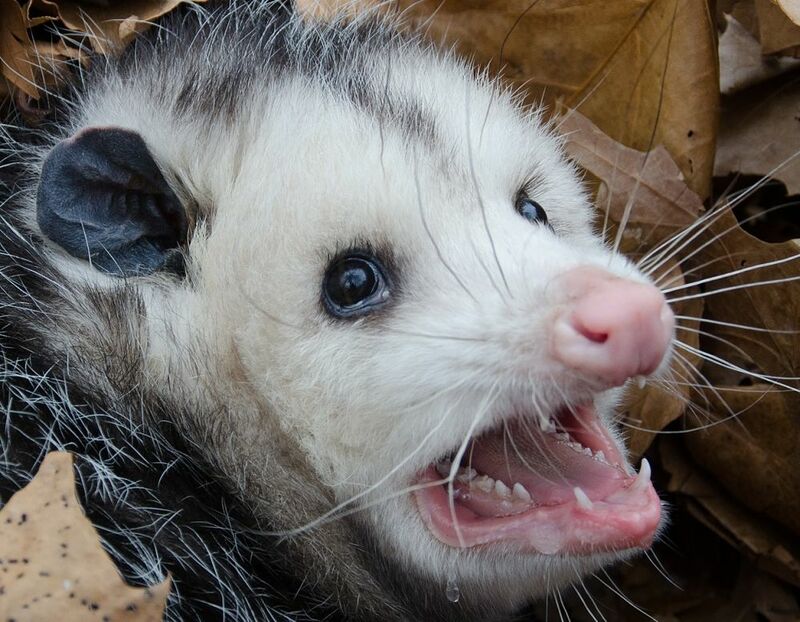 If you approach a opossum, they will greet you with a startling defense display, gaping their mouths wide, hissing and writhing in an attempt to intimidate, and this can be misinterpreted as rabid behavior. 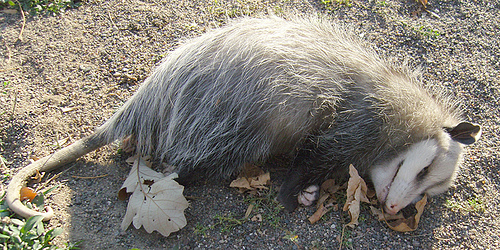 Even the opossums classic defense of playing dead adds fuel to the perception that there is something very wrong, especially when they pick their head up to check if the coast is clear and then fling themselves back on the ground again if it isn't. But despite all their weird behavior, it is considered very rare for the common opossum to contract, carry or transmit rabies. It seems the rabies virus thrives in animals with higher body temperatures than that of the possum. For instance, the normal body temperature of a raccoon is 102.8, while the opossums average body temperature is about 95 degrees, sometimes less. This does not mean they are immune from rabies however, and a handful of opossum rabies cases are reported pretty much annually. But, the common possum is a carrier of leptospirosis, a bacterial disease that appears to be a simple flu, but, If left untreated, can cause kidney damage, liver failure, respiratory complications and even meningitis. 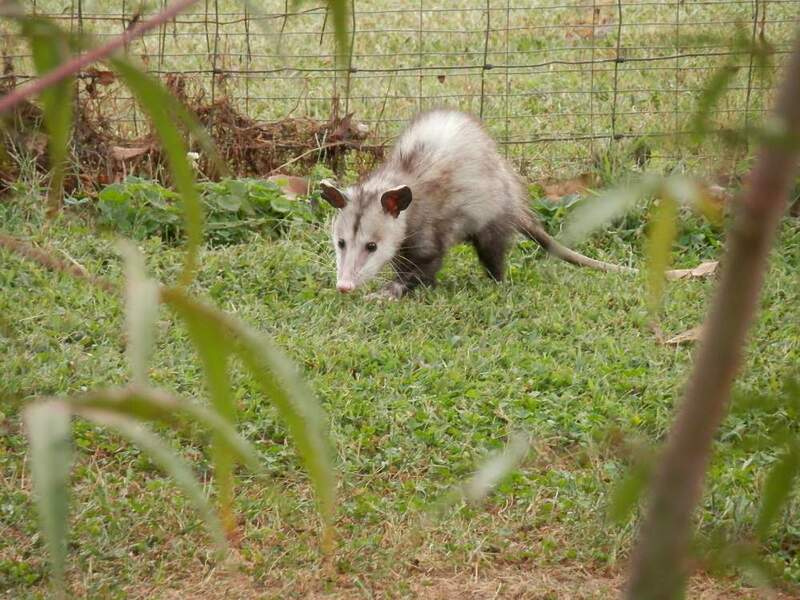 Leptospirosis is spread through the opossums urine and excrement, so keeping outside surfaces they may frequent clean, and making sure your pets are protected from exposure is a good idea. And if you see a possum out in your yard in the middle of the day, just assume it is out for a little stroll, but keep your distance anyway! What possums eat has much to do with where they live. In rural or wild areas, they may be limited to local fauna and flora, but in towns and cities, they enjoy a host of foods provided by the humans that live there. An extremely successful animal that has existed for thousands of years, the opossum has an impressive array of 50 teeth, designed both for ripping and grinding. 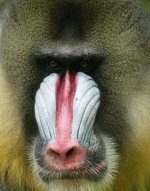 Although they will often bare their teeth in a bluff display to ward off predators, they are really eaters, not fighters. With large canines, pointy incisors, and powerful molars and premolars, the completely omnivorous opossum is prepared to consume practically anything. The common possum is an intelligent, resourceful opportunist, and will eat fruits, vegetables, roots, tubers, worms, insects, small rodents, reptiles, carrion and roadkill. They may raid garbage dumps and garbage cans, gardens, ponds and even chicken coops. 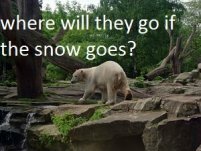 They don't just scavenge, but will actively hunt small birds and animals, and vigorously dig up insects they detect below ground or in hollow logs. 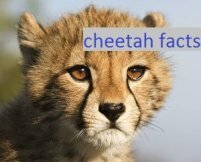 They will use their strong claws and dexterous front paws to rip open burrows, have been known to hunt and eat rats, and will open food bins to get to goodies like dog kibble and cat food. One of the most remarkable things possums eat are ticks. 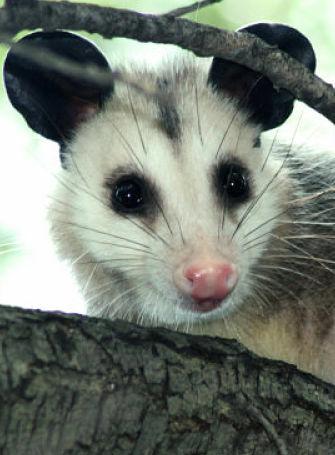 In fact, most opossums will remove and eat 90% of the ticks that try to bite them. A healthy opossum population can actually reduce the risk of tick-borne diseases such as Lymes, due to their unusual tick-hunting abilities. The opossum is the only marsupial found in North America, meaning, like kangaroos and koalas, the female opossum carries her young in a pouch. Opossums are generally solitary animals that come together only to mate. 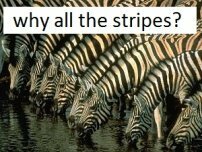 After just 12 days or so (the shortest pregnancy of any mammal in North America) the female gives birth to as many as 18 babies, called neonates, because they are still in an embryonic from. 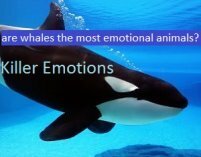 They are incredibly small, only about the size of a raisin, and must make their way to the mothers pouch to continue to develop. Immediately after birth they are compelled to move in an involuntary swimming motion, across the mothers belly to her pouch, a trip of about 4 inches. Eyes and ears are not open, but their sense of smell guides them, and the mother opossum will lick her belly, making a trail for the opossum babies to follow. 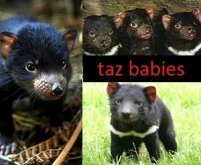 The mother does not help them to the pouch, and some believe this may be a way of weeding out weaker babies. When they reach the pouch, called a marsupium, they latch on to a teat. Once latched on, the teat fills with milk, and the baby opossums are basically locked in place for 8 to 10 weeks as they continue to develop, protected from the outside environment. The babies are remarkably safe inside the pouch, and are often found unharmed, even after the mother has been hit by a car. It is recommended that one always check the pouch for baby opossums in the event that a dead adult is found. 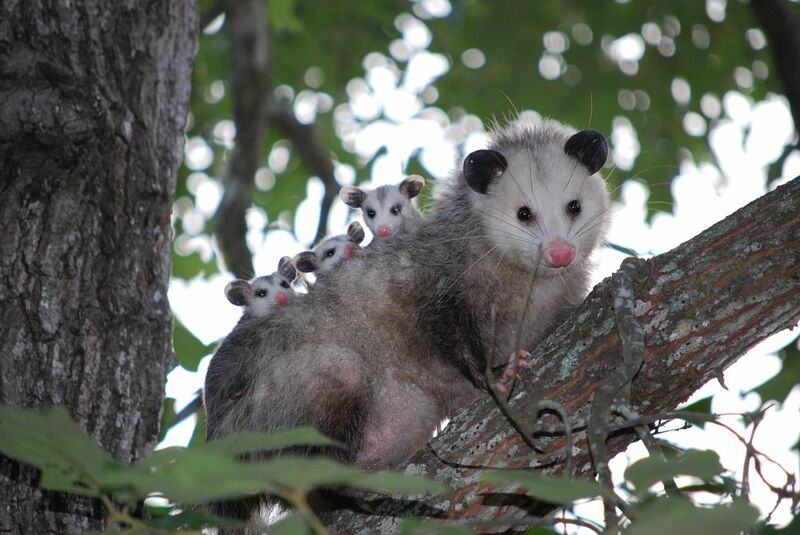 Once the opossum babies, called joeys, are old enough, they will ride on their mothers back, clinging with strong claws and their little prehensile tails. Only baby opossums hang from their tails. Adult opossums are too heavy to support themselves with just their tail, instead, they use it as a sort of fifth limb while climbing. 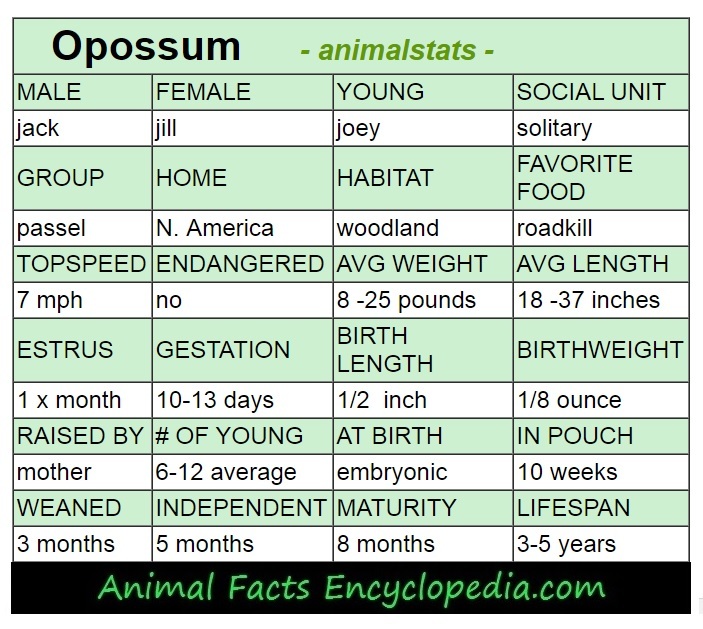 Possum babies start off super small, but grow quickly and are mature and on their own by the time they are about 4 months old. 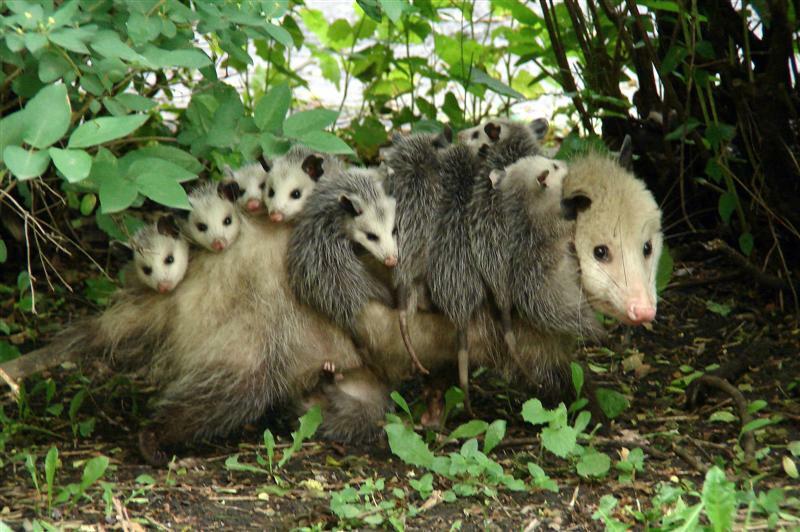 Mother opossums often have more than one litter a season. There are two entirely different families of animals called possums. 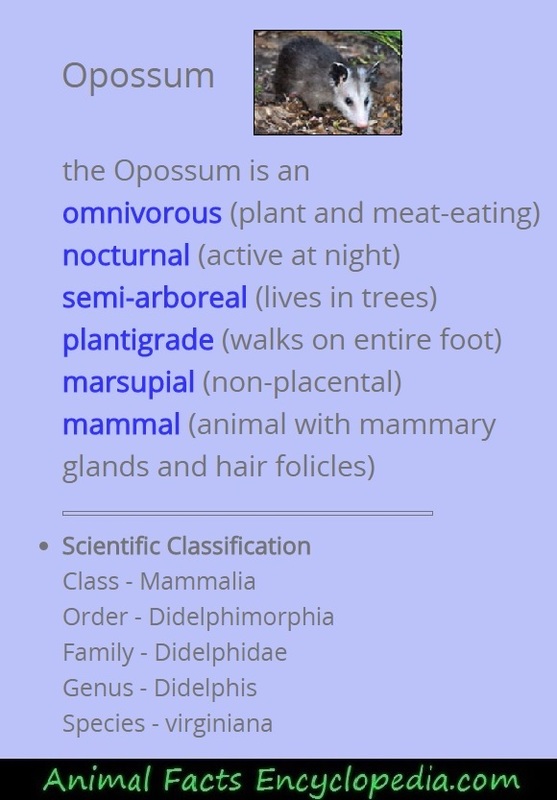 The family Didelphimorphia includes the opossum discussed in this article, but there are over 100 other species in family. 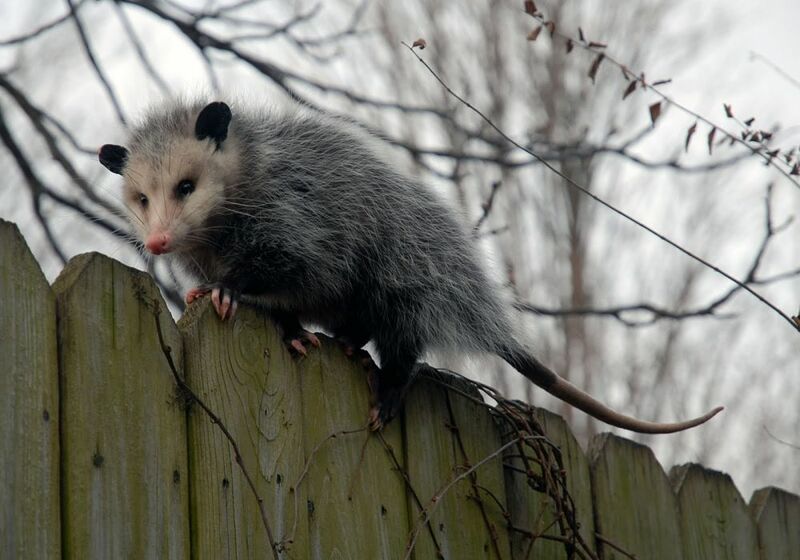 Only the Virginia opossum, also known as the North American opossum or the common opossum, is found in North America. 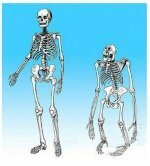 The remaining species are found throughout Mexico and Central and South America. Another zoological family not closely related to Didelphimorphia is Phalangeridae, which includes about 70 species of small marsupials. This group is referred to as "possums" without the "o". 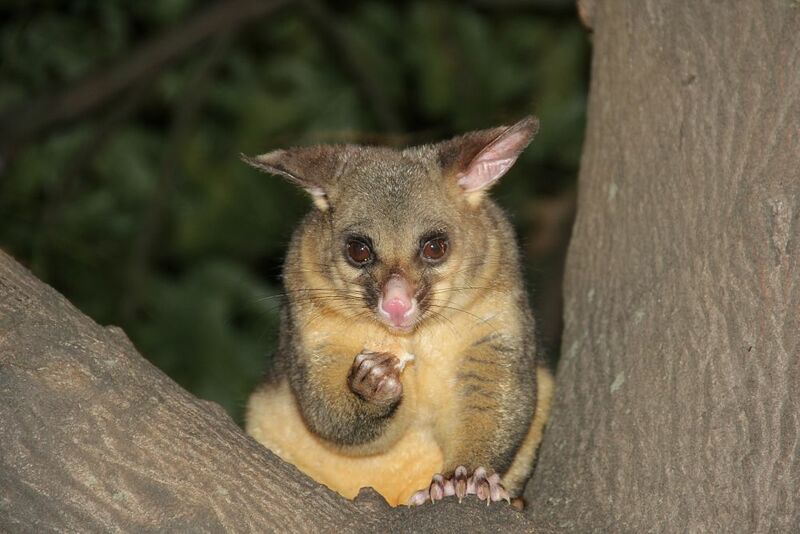 Native to Australia and Indonesia, the old world "possums" include some very familiar little animals. The brushtail possum is the most wide-spread marsupial in mainland Australia, and is similar to the North American opossum in size. 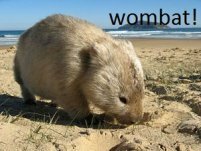 It also has a prehensile tail and spends a great deal of time in Eucalyptus trees where it feeds on leaves. 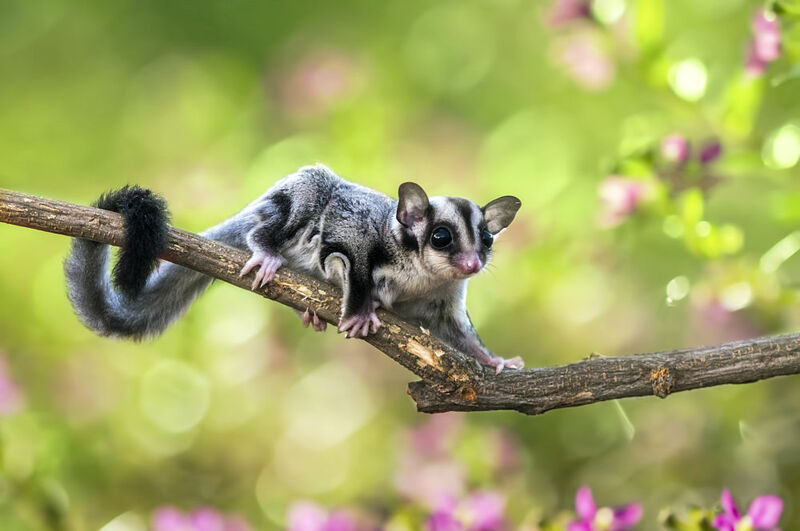 The beautiful little sugar glider belongs to the family Petauridae, another dozen or so little possums native to Australia, Indonesia, Tasmania and New Guinea. The sugar glider has a membrane of skin draped between the wrists and the ankles that act as a sort of parachute, allowing them to glide long distances between trees. 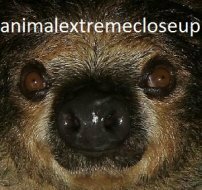 These animals have become popular pets as well, although one look at their massive eyes will tell you they are quite nocturnal, and that doesn't stop just because they are living in an apartment. Noisey nighttime activity, including lots of vocalizations is the number one negative of sugar gliders as pets, but if you don't mind a little action after midnight they can be very sweet and charming companions. No relation, however, to the Virginia opossum. 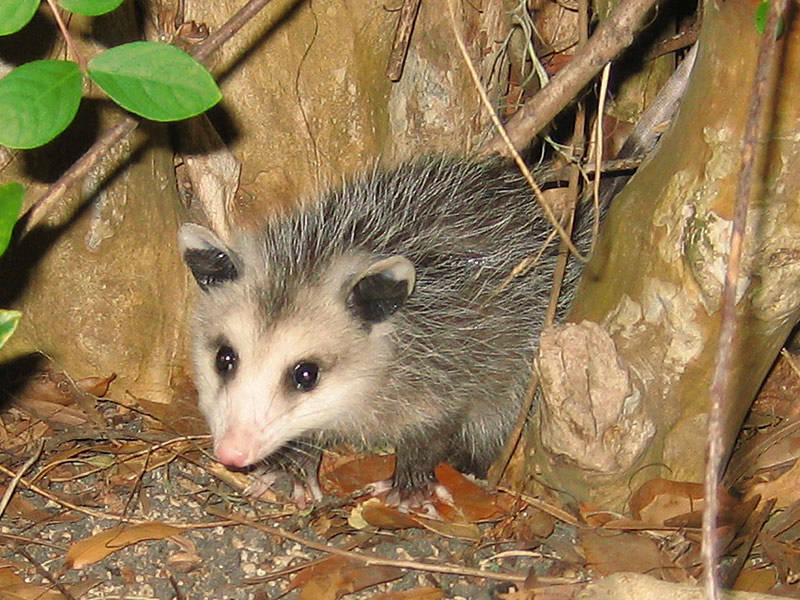 The opossum is often called possum, leaving off the "o"
Opossums raise their young in a pouch called a "marsupium"